As I mentioned in the last post, I started to do some work on the original linesplan for the late 19th century decked sailing canoe Isalo to explore making the arc bottomed hull suitable for the flat panels of stitch-and-glue construction. I began drawing by hand, but then I decided to put the lines on the computer and see what I could come up with. To do this, I used a hull design program called DelftShip, a development of an earlier program called Freeship (which is still available from SourceForge). 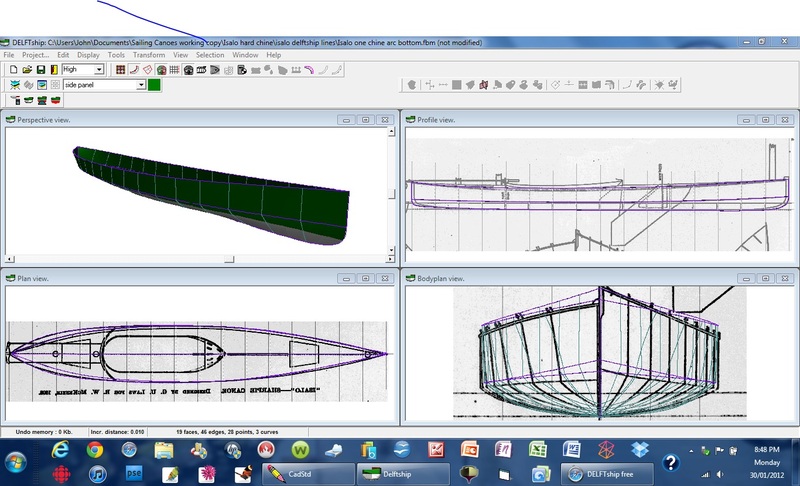 Both programs are powerful, full-featured naval architecture packages, and both are free. Once you figure out how to use them for canoes, you could also design yourself an oil tanker, passenger ship or tug if you’re so inclined. A professional version of Delftship with more features is also available for €150, with the latest version slated for release in late February. These programs have a steep learning curve, no pun intended, but are well worth the investment of time. 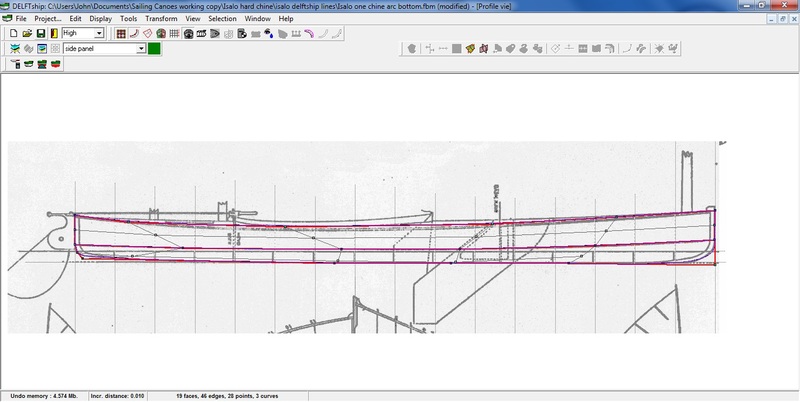 One thing they’re particularly useful for is projects like Isalo, because with them you can import a scanned linesplan of unknown scale, such as you might find in a magazine, and, as long as you know a couple of the principle dimensions, draw new fair lines on top of the original. There’s a handy tutorial about how to do this, based on, of all things, Leo Friede’s legendary 16-30 sailing canoe Mermaid on the WoodenBoat Forum. If you use this tutorial, go through it with the DelftShip manual in front of you, because author Bruce Taylor leaves out a couple of important steps whose absence will drive you crazy until you also read the DelftShip tutorial on Reproducing An Existing Lines Plan, which you can download from the company’s web site. This is the main Delftship window with all four views: perspective, profile, plan and body plan. 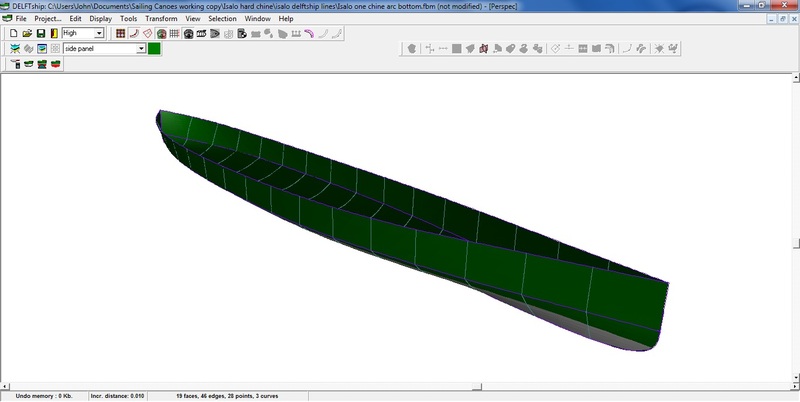 Much as with regular lofting and fairing, you alternate between them, working iteratively on each one to gradually firm up and reconcile the lines. In each case, the starting point is the original linesplan in a background layer, on top of which you work with curves and the control mesh to shape the new lines. Here’s the profile with the three main lines defined: the centreline of the hull [composed of bow, stern and bottom], the chine and the sheer. And here’s the body plan, with the control curves [red] and stations [green]. 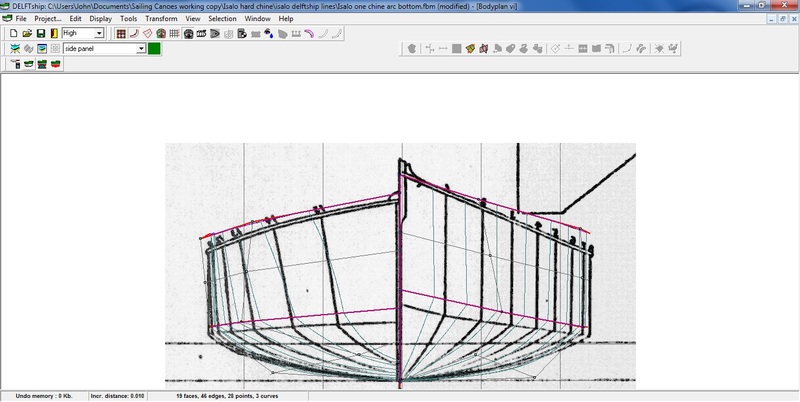 Once you begin to develop the wireframe, you can add the other side of the hull and shade it to check on your progress. One of the most useful features for a project like this is that you can also run a developability check on the panels to see if they can be gotten out of plywood, which nominally doesn’t like to do compound curves, though you can torture it into shape to a certain extent. When you use that feature, the program adds red shading to show you areas that can’t be expanded into flat sheets. DelftShip is telling me that the sections below the chine aren’t developable, which is not surprising since they’re still the original rounded arc bottom. The good news is that I seem gotten the topsides pretty straight, as it’s all green from sheer to chine. The next step is to go back to the body plan and make sure I’ve added enough curvature to the bottom to capture the volume of the original hull below the waterline. After that, I’ll ask DelftShip to calculate the hydrostatics to get some numbers against which I can compare my multichine versions as they’re developed. I recently received a note from my friend Ed Maurer down in Florida. A couple of years ago, Ed took the brave step of starting a new magazine called Canoe Sailor, which is a noble project in its own right. In this case, it was even better because the magazine was focused on, of all topics, sailing canoes–imagine such a thing! Skinny Hull covers sailing canoes and kayaks, proas and similar style boats, Chesapeake log canoes and a variety of purpose-built two- and three-hull boats that are essentially canoes (or kayaks) with outriggers. (We’re even working on bringing you ice boat sailing!) So, essentially, if it mounts a sail and has a skinny hull we cover it! 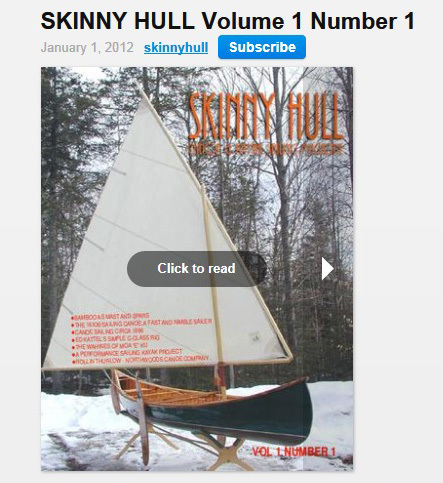 The first few issues will contain archived content from Canoe Sailor, and there’s some good material there. Like any editor, though, Ed will be looking for new content too. I’m going to try do do my part, and I’d encourage anyone who’s interested in contributing to contact him at editor@canoesailingmagazine.com, and also to subscribe, which I’m going to do as soon as I finish writing this post.